This year was my favorite Thanksgiving since we have been in Utah! Such a wonderful day that absolutely flew by! Having two kids is just a time zapper. I don't know where the day went, but it was filled with plenty of joy. But before this little glimpse into our day, a bit about my turkey crisis to be followed by a Thanksgiving miracle!!! Can I return this turkey?! Are there any fresh 16 pounders left? I had one job!!! So the sweet lady went to get a manger from customer service for me (bless her heart) and shortly after I am informed that I do not need to take the frozen turkey home. However, he pretty much told me to run to the fresh turkeys because who knew what was left! I scoured the birds that were left and found a beauty that was perfectly 16 lbs, phew! Crisis adverted. Thanksgiving could continue on! Then our little miracle (which is a strong word choice, but just roll with it)... Conor made a liquor store run (which I DO NOT recommend doing the day before Thanksgiving)! Line out the doors, so I decided not to take on that challenge with both kids! He had quite the cartful of vodka, wine, & champagne, yet was in & out of there in a fury. As he was unloading all the booze he handed me the receipt.. One bottle of champagne $10. I was confused. Where was the rest of it? I showed Conor... It was his only receipt. Not sure what happened when the cashier rang up his order, but apparently we only got charged for one bottle. Free booze all around!!! I'll cheers to that! All that nonsense aside, we had a wonderful Thanksgiving. Our morning was filled with parade watching, during which I hear Liam say to the TV "Stop talking & show us the floats!" I think he may have heard Conor say that, but oh my was I laughing hysterically at his serious parade watching. We sipped mimosas & devoured homemade cinnamon rolls. This year we used the pioneer woman's recipe. It was a good base recipe which I think we will tinker with for years to come. Our neighbors joined us for breakfast, since we would be having the big feast at their place. Liam is so happy when his friends are around to play, so our parenting was at a minimum. It's glorious, especially on holidays! While Finn napped, Conor prepared the turkey & I made my apple pie. Humble brag here, but it turned out amazing!!! This crust recipe really is the best, and I will use it forever & forever. The apple cider vinegar adds a nice tartness that I liked, plus I'm happy that it's an all butter recipe. I haven't made many pies in my day, but I love the whole process. I hope to find time to make delicious baked goods more often, and this is the season to do it! In the afternoon we took a frigid Thanksgiving Day walk. This has become a tradition of ours. I love getting in a bit of exercise before the big feast. Liam brought his balance bike and we made our way to a park to let Liam get some energy out while Finn ate some leaves (quite possibly his favorite pastime). Then some quick showers & naps before taking all our goodies next door. Dark & Stormy's were the cocktail of choice, along with some of our home brewed cider. The entire meal was delicious & the company entertaining. Our neighbors really do feel like our family here! I'm so happy we decided to celebrate with them! Our traditions may be changing a bit, but sometimes for the better! While I could have lingered around the dinner table late into the evening, Liam was anxious to get home. He knew there was a present waiting for him there... The boys opened up their matching Christmas pajamas, and we watched our first Christmas movie, The Grinch! Liam snarled at the grinch the entire time; I think he was actually a bit scared of him. Regardless, it was the perfect way to kick off the Christmas season. I hope everyone had a wonderful holiday being surrounded by friends & family! Now let's deck those halls and sing a little fa la la la! That pie looks divine and Finn is TOO TOO Cute! Yay for crisis averted! Turkeys' are tough to cook, we never cook our own turkey, we just don't have a great kitchen or energy to do so. And yay for free booze! Must have been a busy day, I made the mistake of shopping the day before, oops, packed with people. Sophie got really bored really quick. I'm definitely checking out that recipe. I've been using another one for a few years now. beautiful pie! And cheers to free booze! Love the idea of Thanksgiving jammies on Thanksgiving night! We actually got ours early this year too. Also, that family photo is absolute perfection. So beautiful. The pie looks so amazing...nice job! Glad you guys had such a good one! P.S. 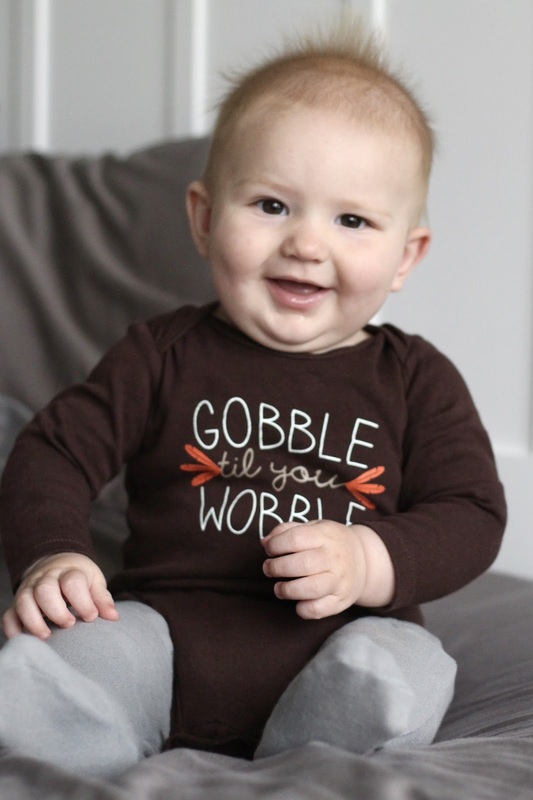 - that top picture of the Gobble till You Wobble onesie is too sweet! I love this! From the turkey madness to free liquor to Christmas pajamas and movies, this sounds like the most perfect/crazy Thanksgiving! You can't have any good holiday without a little drama, right?! What a perfect Thanksgiving, even away from family! Thank goodness for being able to get a fresh turkey and free booze? Yes please! I think we need to incorporate a walk into our day next year because we pretty much had to roll ourselves into bed that night! What a great thanksgiving!! I can't imagine being far away from family, but you guys seem like you've made some great friends there! Your pie looks fantastic!!! I am so glad you guys had a great Thanksgiving and that it was filled with joy! I would have went home with the frozen turkey (had someone not said anything). Glad they helped you before you left!! And wow, free booze. That’s awesome. And that pie? Looks amazing! I need to up my cooking & baking game. How nice to have neighbors that feel like family! Great pictures. I love that last one. Sounds like a perfect Thanksgiving! I love the Christmas jammie idea on Thanksgiving night--I've had mine wearing them for about 2 weeks now. ha! Free booze - what a PERFECT day!! 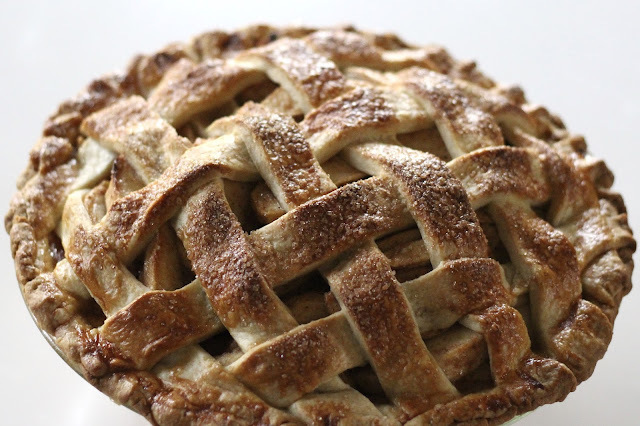 ;) Your pie is BEAUTIFUL, way to go!!! 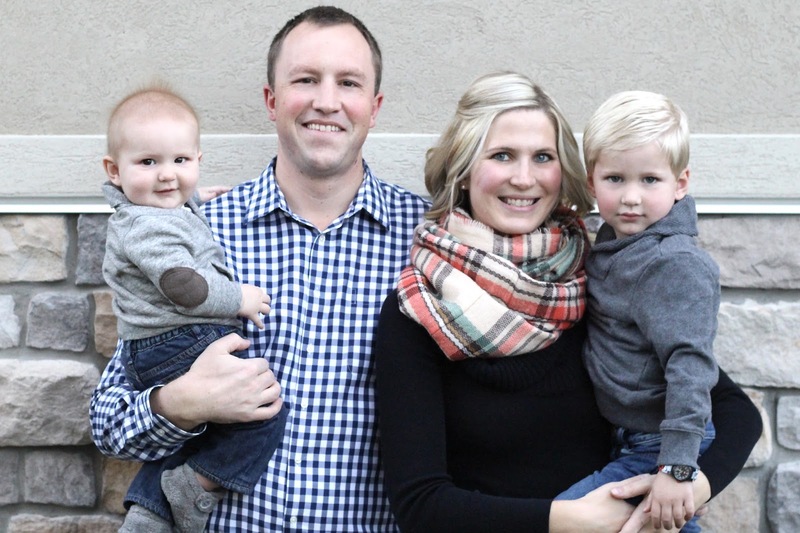 :) Also, thoroughly impressed with the family photo, it's great, but Liam takes the cake with the intense stare (and his watch?!). You guys are too cute!! Yea for December..!! Love your crazy turkey and liquor store stories. That apple pie looks divine! It almost looks fake! Great job! My apple pies never look that good! !